« Paulo Orlando takes bundling up VERY SERIOUSLY. 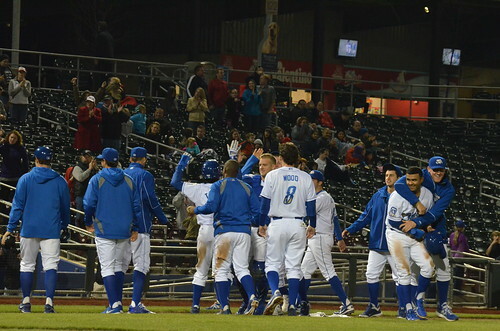 The Storm Chasers held a 4-2 lead in the top of the 9th and one out. 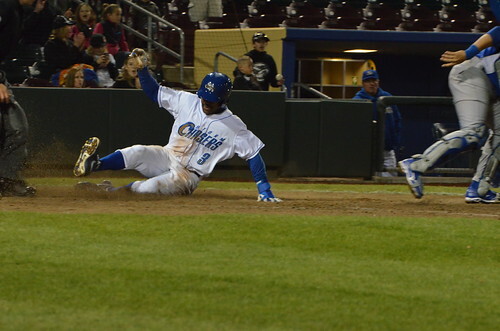 Donnie Joseph seemed to be cruising, but a tough ground ball put an Iowa runner on base, and Jirsch elected to go to righty Michael Mariot to get the last two outs. Instead, Mariot surrendered a home run to PH Brad Nelson, and the game eventually went into extras. It’s a shame, really, because Chris Dwyer had a really nice start – 7 innings, 5 K, 1 BB and just two runs. It actually looked like Iowa had Dwyer figured out in the 4th, when they scored both of their runs against him. Every Cubs batter that inning went aggressively after the first or second pitch, and it paid off. But Dwyer got things back on track and didn’t allow any additional runs. Mariot ended up with a vulture win, further proving that the W is the best stat and should never be questioned. 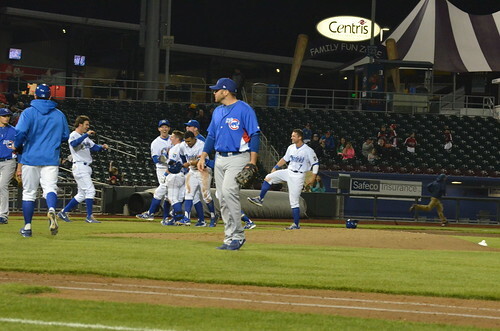 I was in the Cubs’ dugout, so I had to shoot past sad Iowa players to get a view of the celebrating Storm Chasers. More celebration. I love Nathan Adcock hugging on Christian Colon over there on the right. So fun. Photos of the day: ANOTHER walkoff win in Omaha!